Paradise is in the eye of the beholder, it’s true, but if there is any place that conjures up “South Pacific”-style images of tropical splendor, it’s French Polynesia. Maybe that’s why, post-snorkeling tour outside a hut in Taha’a, we are being treated to yet another rendition of “There is Nothing Like a Dame” by a group of middle-aged men waist-deep in the surf. They aren’t bad, but the waitstaff are rolling their eyes. They hear this song frequently, it would seem. I am too busy grappling with my own problems to be taking in the show. On my plate are a buttered piece of white bread, an indifferently grilled hunk of tuna, a glob of mayonnaise-and-potato salad, heavy on the mayo, and an unpeeled banana. This is lunch, a meal I once loved and looked forward to. Now mealtimes are a chore, an opportunity to demonstrate my repertoire of socially awkward gaffes to strangers, where I must parade around in “country club casual” in order to get fed. This trip has, in a sense, unmanned me. Where I once commanded legions of dishes, sowing destruction on restaurant tables near and far with my trusty fork and knife, striking fear into the hearts of servers everywhere, I now … I just am not up to it. Jewel-like rounds of poisson cru, diced and mixed with coconut milk, freshly steamed mahi-mahi, paired with slivers of lime, splinters of just-cracked fresh coconut, skin attached — I should be into this. But just as the tropical splendor about us is relatively untouched and left in its natural state, so, apparently, goes the local cuisine — steam, boil, mash, grill. Season with lime and/or coconut juice. Repeat. Getting my grump on makes no sense, I know. Tahiti, Moorea, Bora Bora, et al — this loose collection of mountainous islands must have looked like paradise on earth for the first settlers to reach their shores: Southeast Asians traveling via boat from Malaysia and Indonesia. No snakes could live in the dense jungly undergrowth, islands boasted a mix of fresh and seawater seafood, and the volcanic soil proved readily able to support any assortment of plants: chestnut, almond, banana, papaya, vanilla, pineapple. They steamed taro in underground pits and blanched the leaves like spinach. 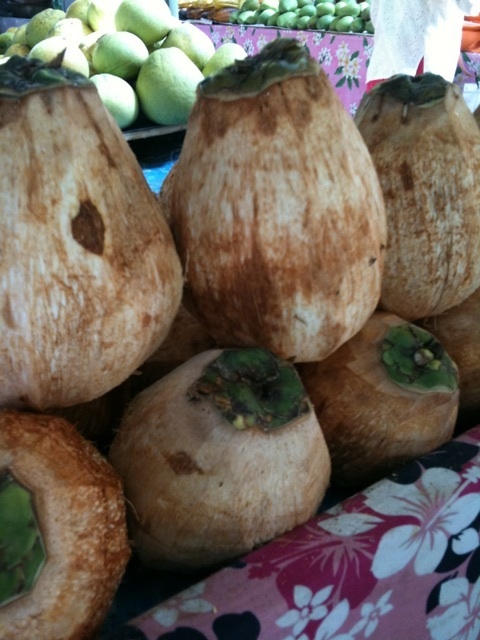 They ate coconut flesh and used its milk as seasoning. And then there was breadfruit. Known in Thailand as sake, it was a valued part of the local diet, but instead of being thinly sliced and boiled in syrup or used to adorn curries (as in Thailand), the Polynesians boiled and mashed it with coconut milk, or simply roasted it. 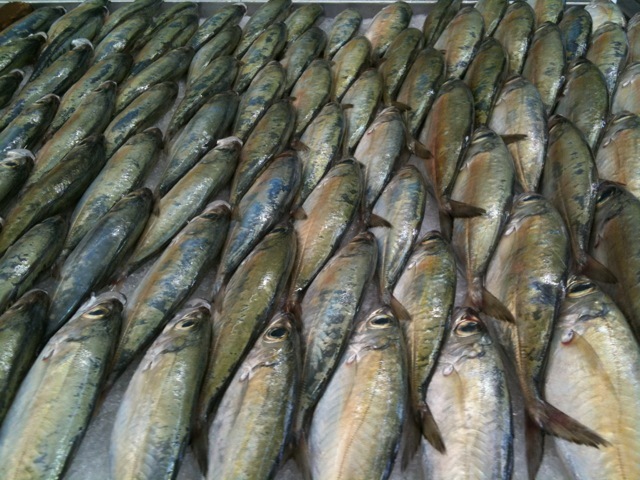 And the fish — grilled with lime, there was nothing easier or better. Unless, that is, you had it every day, in a sterile setting like the basement of the local town hall, a work event with acquaintances you barely know, your watch reminding you that life is slowly passing you by, but you are trapped, stuck in a prison on water, not able to do anything but take a deep breath and eat. That is what being on a cruise ship for 12 days is like for me. Every place is open to you — for 4 or 5 hours, within a carefully constructed tourist environment. Then it’s back to a ghostly existence, flittering neither here nor there, with food meant to appeal to everyone but moving no one. I realize then that eating something prepared by locals, discovered on one’s own, is travel, at least to me, and an untasted land is an uncolonized one. The frustration drives me batty. I do better on my own. I escape, for a day, on Moorea, running like a fugitive with my octogenarian aunt from a “free” van meant to hustle us into one of those black pearl shops ubiquitous on the islands. We rent a bug rider, a noisy golf cart equipped with 4×4-type wheels. The locals ignore us, used to the buzzy spectacle, but the other tourists gape, and I realize we must look funny, a tall, slim elderly lady and a fat Asian one, folded inside a go-cart meant for a child. Our reward is this: a sleepy little restaurant tucked into Pao Pao Bay, a blackboard proclaiming specials like moules frites and mahi-mahi with vanilla and run by a sweaty French man with a walrus moustache. Maybe it’s because we have escaped our excursion tour overlords for the day; maybe it’s because it’s just the two of us and we know each other; maybe it’s because we’re on land. 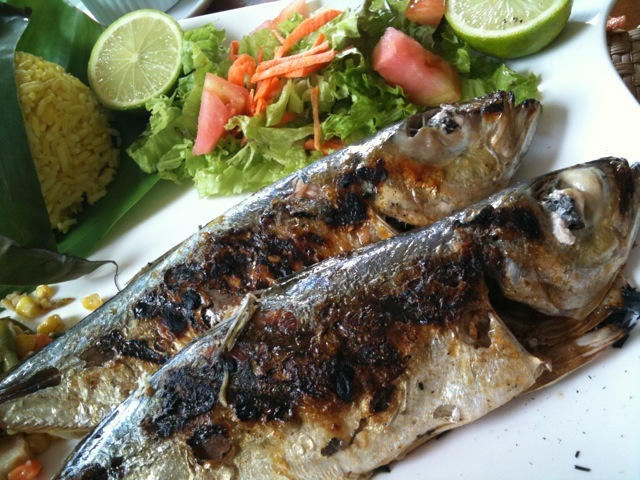 But it’s the best meal we’ve had our whole trip — grilled orare, or sardines, lightly charred, reminding me of Thai platu, with a side of yellow rice smelling of coconut. Oh no! 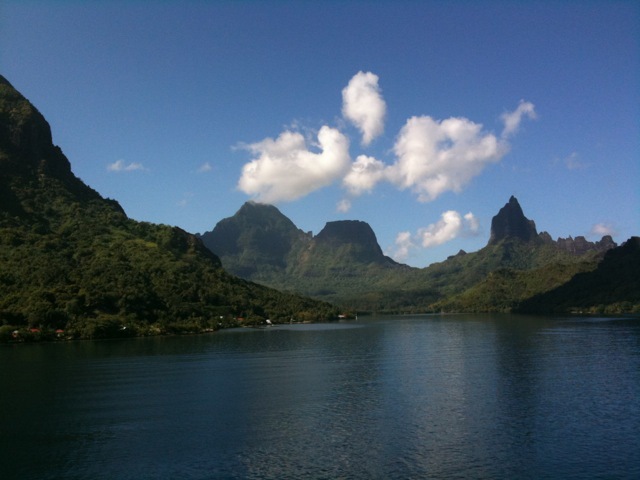 Tortured in Tahiti, Miserable in Moorea! It’s a hard knock, cruise around life I guess. Anyway, take my heckling as a sign of jealousy. This is so well written and delivered. Was excited for you at the end. Would have loved a picture of you in that golf cart lol, and more pictures from the table! Hope to talk and eat together soon. Haha, thanks Dwight! Hoping we can get together and talk in the coming days. Going on a cruise has never really appealed to me. Even less so now. For some reason the image of you driving some 4×4 with your aunt on it seems funny. My 87-year-old aunt drove. I can’t drive! I so much love the image of you and your aunt, fleeing the herd in a golf cart to colonize a tiny part of the South Pacific. Thanks, Janet! Hope all is well with you. You just re-enforced my affirmation to never ever go on a cruise. Torture! Yes. This is what I have promised myself as well.